Pheasants are often hunted as game. Game is any animal hunted for food or not normally domesticated. Small birds, ground game (such as squirrels and rabbits), and big game (such as deer and moose) are usually hunted. Game animals are also hunted for sport. 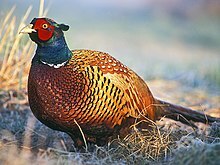 In Britain, game birds usually means partridge, grouse, and quail. Today, most countries have game laws. In some countries hunting is a part of well preserved tradition that is kept alive as a part of national identity. ↑ "game (meat) -- Britannica Online Encyclopedia". britannica.com. Retrieved 9 July 2010. This page was last changed on 5 December 2018, at 00:00.